Creating a great Rose Red metal flake paint job is super simple with our Flake. Just choose your base coat (black is good if you want the paint to take on the color of the Flake), and add a heaping tablespoon of our flake to any clear coat (although we recommend a base clear for mixing the flake into, like PPG’s DBC-500, or HOK’s inter coat clear). 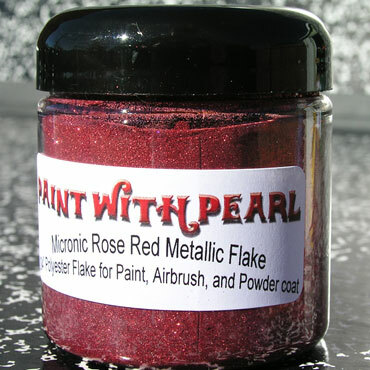 Keep in mind, that even though they are called “Rose Red metal flake”additives, most of our Flake are made from special solvent-resistant polyesters that can withstand the chemicals in the clear coat. See our tips pages for more information, our download our instructional PDF. Remember, unlike some Flake that people dust onto wet clear-coat dry and spend about 400 bucks for 20 jars of flake to paint a single auto, our system is much more efficient. 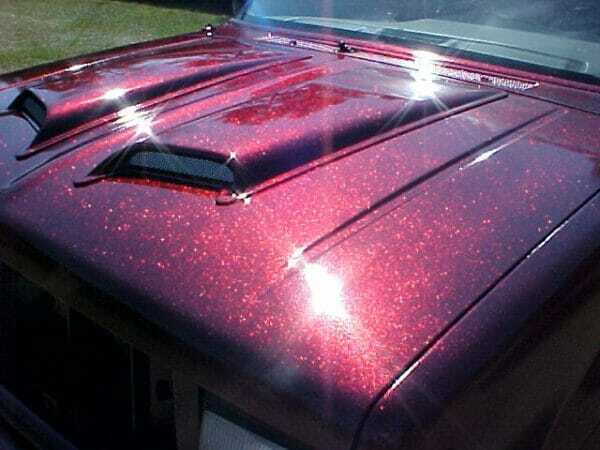 As we say around here, “One jar paints a car.” Visit our FAQ page for more answers to your questions, or contact us, we are always ready to answer questions. One 4oz, Jar or choose 1 lb. of Gold Green Blue Chameleon Flake. Change Color with light and direction. One 4oz, Jar or choose 1 lb. of Aqua Blue to Purple Chameleon Flake. Change Color with light and direction.